Seville was our last stop in Spain. Funny enough when we arrived in Seville and began to explore the first thing Joe said was, "Now this is what I expected Spain to be like." I'm not exactly sure what it was - perhaps the giant bull fighting ring in the centre of town or maybe it was the atmosphere in the city as their largest festival of the year had just ended. In any case, Seville had a lot to offer. Like we did in all of the other cities, we spent a lot of time wandering the streets, browsing the shops and stopping for drinks. One of the main attractions in Seville is the Real Alcazar, a royal palace in the city which originally was a Moorish fort. It was fascinating to stand in a room where Christopher Columbus once stood after his second voyage. The chapel is also home to one of the first paintings of the Americas and of Columbus himself. 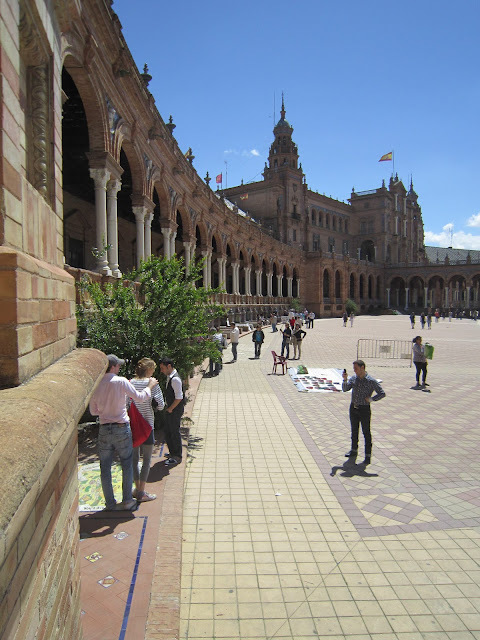 I loved the Plaza de Espana and could envision ourselves wandering the park, people watching, riding bikes and taking naps under the trees for hours. 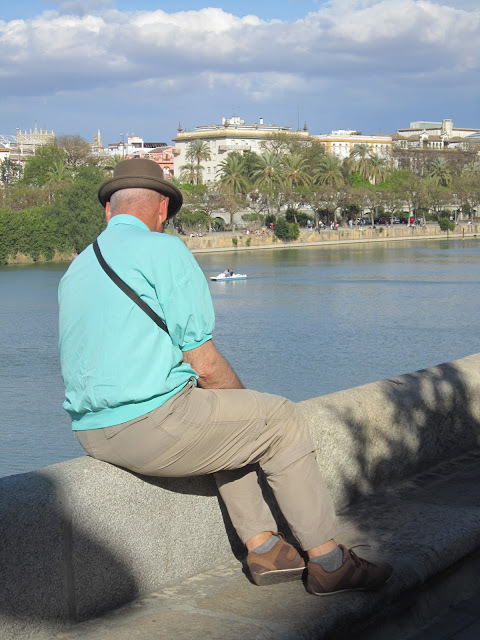 Seville was fantastic and the more time we spent there, the more I liked it. Life felt easy and relaxed and it was the perfect place to cap off our Spanish holiday. -We stayed at Hotel Monte Triana primarily because we were looking for somewhere easy to drive to (after trying to navigate Granada we didn't want to drive right in to the centre of town) and this was close enough to walk to the attractions. The hotel rooms have recently been renovated and they were clean however this was the hotel I was least impressed with on our holiday. It was quite loud and there were all sorts of little problems in the room. -Both Joe and I needed a break from Spanish food and we found a fantastic little Italian place called Osteria L'Oca Guiliva. We had such a great meal that we went back for a second time. It opens at 8:30 pm and it was always full minutes after the door opened. Reservations are recommended. -There was always a line at the Real Alcazar but it moved quickly. Again, we went in the morning to avoid the biggest crowds. There are some seriously gorgeous pictures. I didn't actually expect such pops of colour for Spain on the buildings. 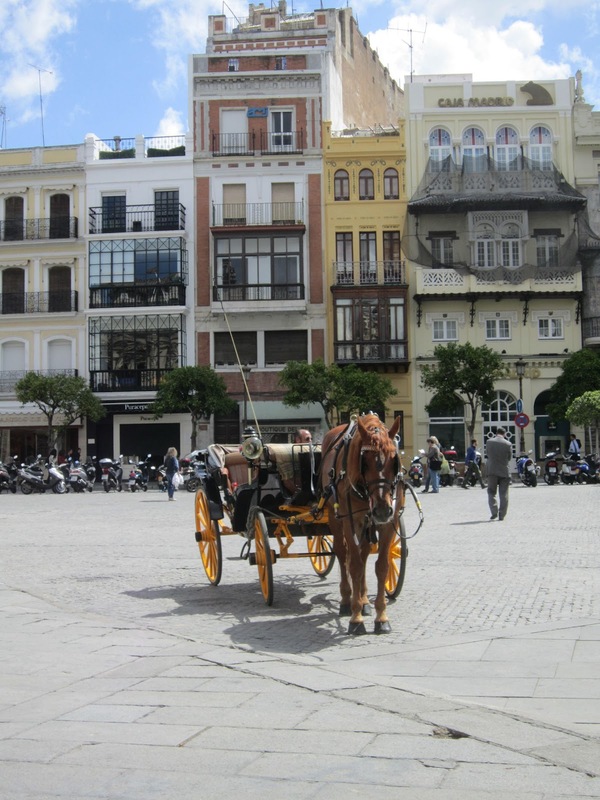 I especially like picture 8, where is that in Seville? You are right - there was a lot of colour in Seville, moreso than other cities we visited! 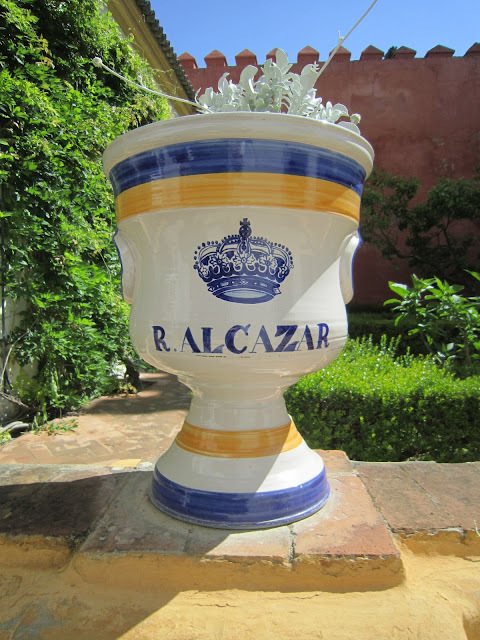 #8 was in the Real Alcazar grounds - I think just before entering the gardens. Wow, you guys saw a completely different side to Seville than I did! I was only there for half a day or so on a train layover and basically just wandered around aimlessly until I stumbled across a beautiful cathedral. From the glimpse I got I knew I would want to visit again, and your pictures make me want to visit even more. The city looks beautiful! Oh wow it's breathtakingly gorgeous! Definitely on the Bucket List!!! Jacquelyn - Seville was wonderful as were all of the other Spanish cities we visited. I had no idea Spain would have so much to offer! I hope you make it back there someday! i always hear that seville is spains most beautiful city...these pictures surely do that justice! i have only been to madrid and one time so im itchin to see what else spain has to offer! I am in love with the architecture in Spain! They ALWAYS make for gorgeous photos such as yours! that's exaclty how i felt! it was the spain i always imagined! i love love love seville!